Welcome to the band page for Swing City Express. 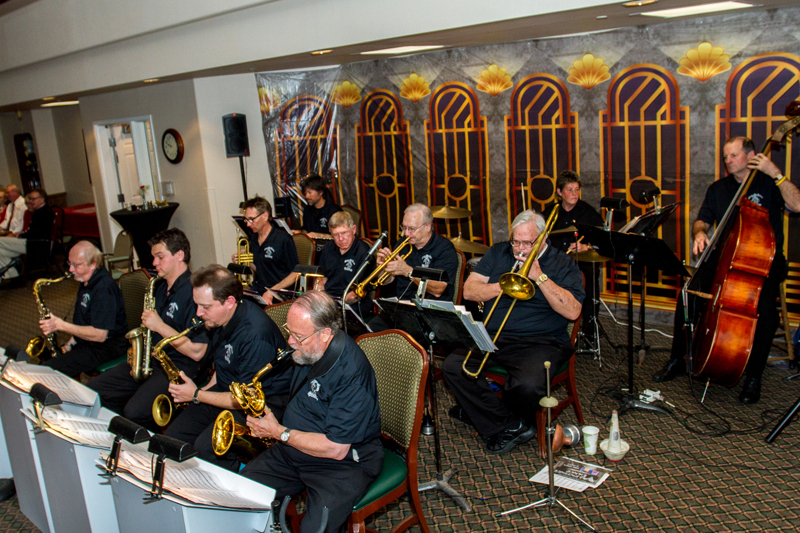 We’re a swing/jazz band and play concerts, dances and weddings. We specialize in 40’s swing, jump swing and latin styles for dancing. For weddings, given sufficient notice, I will write a custom ‘first dance’ tune if it’s not in the current dance book. We arrive ready to play all the music needed for the wedding reception activities. For concerts, we can provide an array of different musical concepts ranging from swing, jazz, concert jazz and specialties like Ellington, Basie, Miller, Goodman or even jazz big bands like the Bill Holman or the Terry Gibbs Dream Band or other specific musical artists and/or groups. Music is the best way to add value to guarantee a successful gathering or reception. It’s the most important single element in your event. Price for up to a three hour Saturday or Sunday dance, concert or event is $1000.00 for nine musicians and $1300.00 for twelve musicians. Price for a two hour concert, Monday-Friday, is $500.00 for nine musicians and $650.00 for twelve musicians. Please listen to some of our swing dance music….